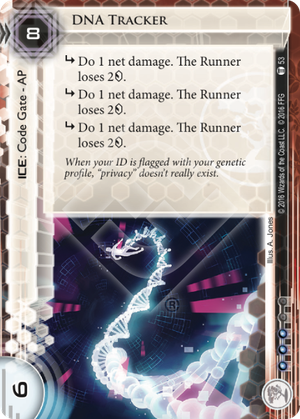 So, I'm a little surprised that this card got printed, at least that it got printed as a Code Gate. A common practice among runners is to get their Killer installed as soon as possible and then to start making runs. Granted, there has always been risk to running without your Decoder installed. You might lose a click to Enigma, a couple credits to Datapike, or take a net damage from Yagura. Inazuma could do a ton of damage, but being positional, you don't see it often. Merlin could lose you the game if you are unlucky, but the Grail suite costs a lot of influence, so you don't see that often either. So while there was risk, I think most thought it an acceptable one, letting you put pressure on the corp as early as possible. DNA Tracker could change that. If you facecheck it unprepared, it is going to hurt, and hurt a lot. Three net damage and up to six !! Wow! Even when it is rezzed and you are ready for it, a six strength, three sub Code Gate is nothing to sneeze at. The eight rez cost is an epic bargain. Black Orchestra: 9 for each. Crowbar: 3 and 4 other breakers installed for Tollbooth and 0 and 5 other breakers installed for DNA Tracker. GS Striker M1: 9 for Tollbooth and 6 for DNA Tracker. Houdini: 6 for Tollbooth and 5 for DNA Tracker (in each case, 1 has to come from a stealth card). Passport: 8 for Tollbooth and 7 for DNA Tracker. Peregrine: 7 for Tollbooth and 9 for DNA Tracker. Refractor: 4 and 1 stealth for Tollbooth and 3 and 2 stealth for DNA Tracker. Sage: 5 for Tollbooth with 5 unused MU and 6 for DNA Tracker with 6 unused MU. Study Guide: 4 with a 10 setup cost for Tollbooth. 3 and 12 set up cost for DNA Tracker. Yog.0: 3 and 2 Datasucker counters for Tollbooth. 0 and 3 Datasucker for DNA Tracker. ZU.13 Key Master: 8 for each. Faust: 3 and 3 cards for Tollbooth. 5 cards for DNA Tracker. Knight: 5 for Tollbooth and 6 for DNA Tracker. Femme Fatale (bypass): 1 for Tollbooth and 3 for DNA Tracker. As you can see, in most cases Tollbooth is either equal to or more taxing than DNA Tracker. (Note that Faust or Rex users may prefer to hit Tollbooth despite the cost in order to save on counters/cards) There are a couple things to note about Tollbooth though. Hunting Grounds is a easy splash in any deck and it neutralizes Tollbooths 3 tax, making it so much cheaper to get through. If you run into Tollbooth with only 2 the run is ended sure, but you don't lose anything. If you have 3 or 4 and a breaker installed, you can pump the breaker until you have 2 again avoiding the tax and saving a or two. If you run into DNA Tracker unprepared you are going to feel it. It doesn't matter if you have 6 or 1, you are going to lose all of them (not to mention the net damage). There are a couple downsides to DNA Tracker too though. It is an AP ICE, so Deus X can break it for free. I expect to see it in a lot of decks for awhile. And while certainly not ideal, the runner can run through this if need be. They just need three cards (or one if it is I've Had Worse), no credits required. So you may not be able to hide your game winning agenda behind it thinking you've got it made, the way you might if it was behind a Tollbooth. All in all though, this card is amazing. Just the early game pressure it puts on the runner to either get their Decoder up and running or risk nasty punishment is kind of a game changer. It costs three influence, which is one more than Tollbooth. That's good, though I personally plan to try and squeeze a copy into every deck for the foreseeable future. From the runner perspective, I'd of liked to see one more pip on the card. The reasoning may have something to do with Yog.0. They put it onto the MWL but it is still played often. It is one of the cards I most hate to see hit the table across from me, rendering all my Enigmas and the like worthless. DNA Tracker will give it a hard time though. By way of end-note: Ye' old Leviathan breaks this for 6 , one better than Gordian Blade. Is it time to dust it off and slot it in a criminal deck? No, no it is not.